As journalists and a veritable army of newfound Zimbabwe “experts” join the bun rush to describe the history of Robert Mugabe’s replacement, Emmerson Mnangagwa, there has been much talk about his role in the Gukurahundi killings of the 1980s. Some have said his part in the massacres is “shrouded in mystery”, others that he was the “architect” or “mastermind”. Still others seem to have bought Mnangagwa’s line that his participation is a myth – or that it has, at least, been wildly exaggerated. All of them are wrong. By STUART DORAN. In January 1983, when the North Korean-trained Fifth Brigade (5 Brigade) of the army was deployed in Matabeleland North, Mnangagwa was Mugabe’s minister of state security. That portfolio brought with it control over the Central Intelligence Organisation (CIO), a Rhodesian institution that was partly reconfigured in 1980 when Mugabe took power at independence. Structurally, the main changes to the CIO had been the formal incorporation of the domestic security and intelligence function – previously informally controlled by the organisation through the Special Branch of the Rhodesian police – and the drafting of personnel from Zanu’s department of security into the organisation. Culturally, the well-earned reputation for brutality of Zanu’s security apparatus – which had been superintended by Mnangagwa during the party’s exile in Mozambique – melded with the Special Branch affinity for torture that had become a stock-in-trade as the war against the nationalists had intensified in the 1970s. These elements magnified one another and, predictably, Zimbabwe’s CIO soon became known for its extreme interrogation techniques. This seems likely to become his stock defence. In effect, he claims that he was in charge of internal security, not military matters – and that the CIO had nothing to do with the Gukurahundi. It’s a weak defence that has no prospect of surviving closer scrutiny. But it does contain two grains of truth. The first is that the CIO was not the lead agency in the killings. The vast majority of civilian deaths were perpetrated by 5 Brigade. In the main, CIO officers were engaged in apprehending and interrogating alleged “dissidents”, armed bandits who were operating in Matabeleland and who were, according to Zanu (PF), coordinating an incipient rebellion against the government. Moreover, a significant segment of the CIO’s staff was physically excluded from 5 Brigade’s area of operations. The second grain of truth in Mnangagwa’s statement is that he (unintentionally) put his finger on the fact that the orchestration of the Gukurahundi was not overseen by one man. It was much broader than that. In this sense, the notion that Mnangagwa was the architect or mastermind of the killings is, indeed, false and thoroughly ahistorical. Yet that is where the factual basis of Mnangagwa’s defence ends. On a bureaucratic level, the CIO may not have been at the forefront of the killings, but it most certainly played a critical part in the Gukurahundi. It is important to remember that the Gukurahundi was a lengthy campaign, not a single event. Equally, it involved a number of different angles and an array of targets that went beyond the civilian population in Matabeleland. The broad objective of the campaign was political – to attain a one-party state, which in turn necessitated the obliteration of the rival nationalist party, Zapu. Many “dissidents” arrested, tortured and murdered by the CIO were not rebels but were specifically targeted because they were Zapu office bearers or members of its former military wing, Zipra. The intention was to demolish Zapu structures, while 5 Brigade’s indiscriminate violence against civilians was meant to wipe out Zapu’s grass roots base. CIO officers such as Menard Muzariri were at the forefront of the more focused violence committed during the Gukurahundi. The CIO also provided operational intelligence to 5 Brigade and other arms of government. Zipra personnel files held by the CIO formed the basis of lists used by 5 Brigade to hunt down ex-Zipras and Zapu officials in the rural areas. Further, intelligence garnered by CIO surveillance teams was used by the army to target individuals – the most prominent example being the attempt to assassinate Zapu leader Joshua Nkomo in March 1983. Thus, there was significant cooperation across agencies, and the CIO was an important cog in the wheel. This reality has been obscured by the entrenched perception that 5 Brigade and the Gukurahundi period are synonymous; in other words, that the brigade and its activities define the Gukurahundi in its totality. And there is another aspect of the Gukurahundi’s choreography that has been poorly understood. This relates to the way in which the campaign was managed in practical terms. Coordination between agencies was handled through ethnic and political channels that often bypassed formal bureaucratic structures. It was established relationships between members of Zanu and its former military wing, Zanla, that provided the pathways along which the Gukurahundi ran. Within both the CIO and military, groups that did not fit these parameters – namely, whites and Ndebele speakers – were usually excluded from Gukurahundi-specific operations. There was, therefore, a coterie inside different organisations that was working independently from the rest and conducting what were more or less secret operations. At senior levels, these organic linkages meant that political leaders and ex-Zanla army commanders were heavily engaged in cooperative planning and were often involved in decisions and actions that went beyond the confines of their formal responsibilities. Hence, Constantine Chiwenga, then brigadier of an army unit in Bulawayo that was operating separately from 5 Brigade, nevertheless organised logistics for the latter and had regular informal discussions with 5 Brigade commander Perence Shiri. 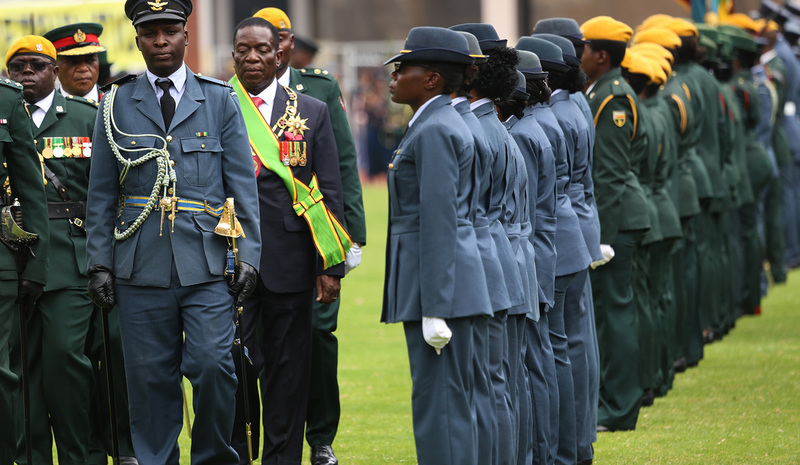 Mnangagwa, as Mugabe’s point man on security-related matters – a role that incorporated strategy, implementation, and a range of portfolios – likewise frequently met with army commanders, transmitting decisions made by the political leadership and discussing operational questions. The notion that he was restricted within the narrow vertical margins of the CIO’s official intelligence function is sheer falsehood. Along with Mugabe and the minister responsible for defence, Sydney Sekeramayi, none of the Zanu politicians was more embroiled in the Gukurahundi than Mnangagwa. He was not the architect, but he was one of them. Of that there is no doubt. An illustration of the tight collaboration among the Zanu–ex-Zanla elite has been provided by Kevin Woods, a white CIO officer based in Matabeleland in 1983. During a security briefing at Chiwenga’s joint operations command (JOC) in Bulawayo – one attended by Mugabe, Mnangagwa and Shiri – Woods expressed concern about the “international repercussions” that might result from the atrocities in Matabeleland North. Amid “great mirth”, he was told by Edson Shirihuru, the CIO’s deputy director of political affairs and a longtime sidekick of Mnangagwa’s, to “stick to basic intelligence work” associated with dissident activity and to “stay out of their war”. Woods was exposed as a South African agent in 1988, an incident that prompted Mugabe to fire Mnangagwa as minister of state security, and his testimony would probably be vehemently denied by Mnangagwa. But black officials – members of Zanu who were stationed in Matabeleland during the period and who attended JOC meetings – paint precisely the same picture, as do Zanu politicians who were in the mix at the time.